So you want to go to Iceland? Sweet, really good idea! 11/10 times I would recommend Iceland, hence this blog. Before I dive in, here are some photos from my adventure. Hope they get you hyped! Hey, I'm Lexi! During my last year of college, my best friend and I decided we needed to do one final trip together before we got real jobs, moved to different states, and life all together changed. 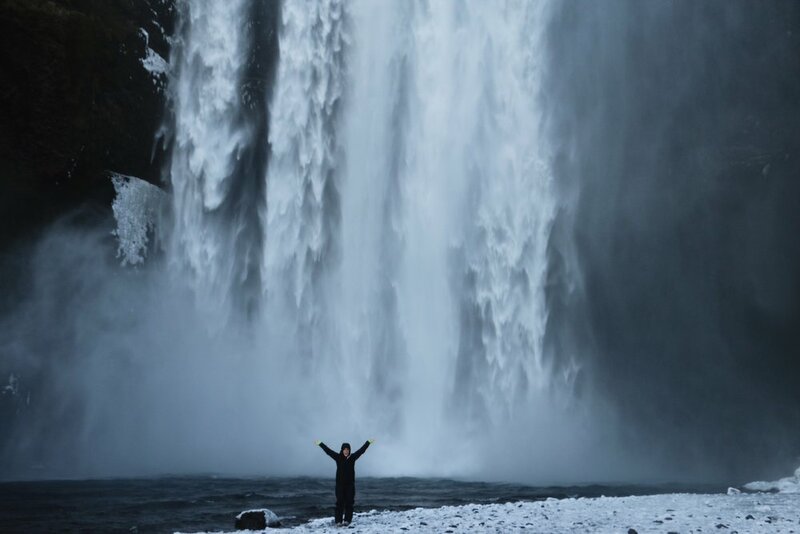 We ended up finding insanely cheap flights to Iceland, booked them on a whim, and planned the adventure of a lifetime. We took this trip in April 2017 and it was nothing short of incredible. I am going to give you hints, tips, and tricks for a janky and cheap college road trip in Iceland! Before you book a flight, rent a car, or book places to stay you should do research on the time of year you are planning to go. I know of some folks who have made the treck to Iceland and only had a few hours of daylight to enjoy this beautiful place. Meanwhile, we had the sun rising around 6am and not setting until after 9pm, giving us ample time to adventure around this picturesque country. The weather can greatly vary throughout the year, meaning intense driving conditions in certain parts of Iceland. It can go from snowy weather to sunshine in a matter of a few minutes, so be prepared. We booked flights through WOW air direct from LAX for around $400. Also note you will need to pay a pretty penny for a checked back or a carry on bag (personal item is included, carry on is not). The fee applies both ways, so we ended up splitting a checked bag and getting a carry on. Next, we booked a rental car for pickup in Reykjavik. It was very easy to pick up the car! We just walked outside and hopped on a bus that drove to all the rental car offices down the road. We stayed outside of Reykjavik that night in an adorable guesthouse! Here is a link to the place we stayed. We set off in the morning to drive the ring road (Highway number 1) counter clockwise. We did not have a 4X4 vehicle, so there was no F-roads or highlands for us. I would highly recommend gravel insurance. There is about 100% chance you will drive on gravel in this country, it's unavoidable. As far as gas goes, to fill our tank HALFWAY cost us almost $50. It was a tiny car too. SUPER expensive so be aware and use the internet before you go to estimate the cost of gas. You can estimate based on the rental car you are planning to get when you arrive which will help you budget. Although gas was expensive, it was worth it. For lodging, Booking.com is your new best friend! SO many options of places to stay, details on all of the things included, free cancellation on many places up until a few days before, and easy ways to communicate. Typically you can pay on booking.com or pay when you get there. If you can, pay for a few places before. It is just nice to get the expense out of the way. As I said before, this was a janky college adventure trip. We were by no means living the high life in Iceland. That being said, every place that we stayed was very clean and well maintained. Although the places might not have boasted the amenities of nicer hotels in the US, they all felt very safe and very clean. I will say, our hands down favorite place to stay was at Fosshótel Vatnajökull. The breakfast provided was really good and the view of the glacier was absolutely breathtaking. Also, everyone told me Iceland was expensive, but people were really vague about it. What exactly does “expensive” mean? I will get to that in a second, but my friend and I brought along trail mix, granola bars, dried fruit, and candy for the road in our suitcase. It ended up serving as our lunch for most days because, ya know, college. Most of the places we booked through booking.com had breakfast included, so we ate a good amount every morning. Then we would have the snacks we brought in the car, and usually a pastry and coffee in the afternoon. For dinner we ate out every other night to cut down on the cost. On the nights where we “ate in” we would have ramen noodles ($2 at your local bonus). I’ve heard of many people packing pasta sauce and doing spaghetti as well. When we traveled to Iceland (April 2017) the exchange rate was 111 Icelandic Krona (ISK) to 1 Dollar (USD). An average meal out was easily anywhere from 1700 (really cheap) - 3000+ Krona. That converts to $15 - $27+. Also, you get what you pay for. The cheap places typically taste cheap. We ate at a few great places in Iceland that are worth throwing down the cash. Here is a list of the best food we ate in Iceland. Fridheimar farm - you guys this is a few hours from Reykjavik and it is the best tomato soup and pasta. You eat inside of a greenhouse where they grow tomatoes and it is an amazing experience. I got tomato soup that is unlimited and comes with fresh bread. My friend got a pasta dish with a fresh tomato sauce. Seriously incredible!!! You need to book a reservation there in advance, and it is so worth it. While we were in Iceland, we found ourselves really overwhelmed on more than one occasion. There is SO much to see and do and so little time. I would like to suggest a few quintessential things that you simply need to do! 2. Stop everywhere for pictures, you wont regret it. 3. Hike to see the plane on the beach. 5. Blue Lagoon. We went on our last day, and it was the perfect relaxing way to end our adventure. 1. They really don't use the Krona here. That being said, don't bother getting money transferred into Krona, you will just end up annoying people and spending money on conversion costs. Everywhere we went not only took cards, but actually preferred them over cash. Just double check that the places you book to stay don't specify cash. 2. The water smells bad, but it is safe to drink! It is alarming at first, but you will quickly grow used to it. 3. The weather is very unpredictable. Always be prepared! 4. Never stop in the road for pictures. Make sure you pull off the road and are safe when getting pictures of the amazing landscape. 5. Bring a travel towel for hot springs! Gloves. You might want to get gloves that work with an iPhone. Gloves (try and find thick ones, waterproof, or windproof) There were multiple times on our trip I wished I would have invested in some nice gloves.